Quilting is a great craft and pastime. We think we can make it much more fun by providing bright, colorful fabrics, and tools that you need to make unique, contemporary quilts. These quilts will be valued for many years of use. At our Quilt Store, we have an unusual assortment of tools and machines. We also provide weekly classes and lots and lots of help to ensure that you find the best quilt fabric for your project, quickly resolve any problems, and get the advice that you need. As you can see, we do not have much of the old traditional fabrics that you have seen at other quilt stores. All of our quilt fabrics are rush ordered from the top design houses. We make sure that we order just enough to keep our customers happy but not enough to fill a show room or a large, ho-hum area in the back of the store. Our quilt fabrics are like fruit, fresh and ready, but they won't last too long. You don't have to pick through the bolts to discover quilt fabrics. As new fabrics are delivered, we quickly produce new, sample quilt tops to show them off. What distinguishes your quilt shop from others? What would make someone drive 100 miles to come to our shop? 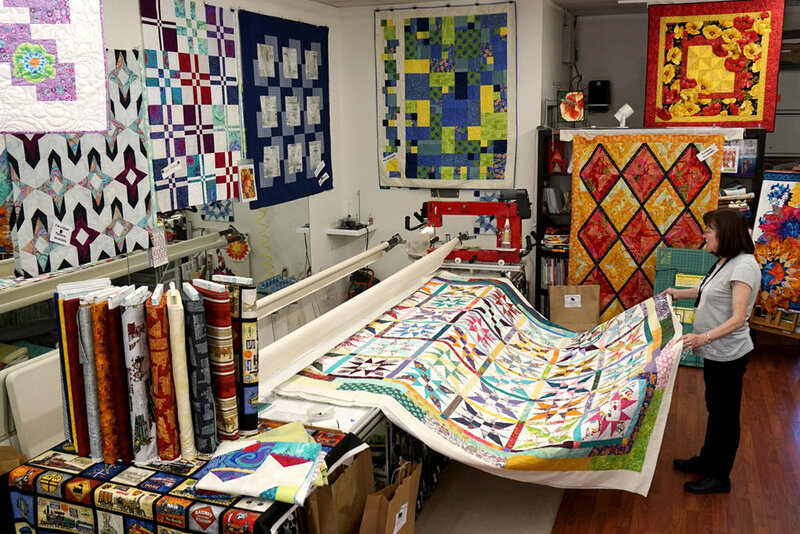 Annie’s Quilting Den is a full-service quilt shop located in North County San Diego. We carry a great selection of fresh, colorful fabric that other shops in Southern California cannot match. Our quilt store is the home of an energetic community of quilters. We stock and sell everything that a quilter needs to make colorful quilts of all sizes. We offer classes designed to build on accomplishments and provide an opportunity to discover and master new techniques. We are happy to provide anyone with one-on-one mentoring that they may need to solve a problem and finish a quilt projects. We are also known as the ‘Kaleido-Manics’ and we specialize in all things kaleidoscopic. We offer an approach that is truly unique. This is not a “Stack-n-Whack”, or a “One Block Wonder” approach, but rather we use fussy-cutting of fabrics that can be bifurcated. In other words, we help artist select fabric patterns that contains an axis of symmetry that can be divided down a line that is exactly the same on the left and right. The kaleidoscopic effects that we teach can add pops of color or areas of interest to almost any quilt. We pride ourselves in offering our customers a colorful, inspiring experience that is ever changing. We’re known for fresh, current shop samples and creative advice. We offer small sized classes, with lots of one-on-one attention. We introduce students to tools and techniques that improve quality and save time. We’ve have also created a successful annual weekend retreat that is very doable for the confident beginner. The projects are bright, creative and allow each attendee an opportunity to express their own individual creativity and they are largely completed over the weekend. Why did we open a quilt shop? What drives you to excel in this business? The business is owned and operated by two partners Roselyn and Barbara. Roselyn founded Annie’s Quilting Den, LLC after progressing as an avid quilter for over 20 years. She worked for Quilt Quarters in Carmel, Ind., and then worked for several other quilt shops in San Diego County. After working for others, she wanted to follow her own creative vision. Three years ago, she opened the doors with the goal of offering her clients access to more creative, progressive quilting including projects and materials they hadn’t seen before. Most importantly, she wanted to offer a fresh outlook on color and design. Roselyn is driven to excel in her business because of her experience as a beginning quilter. When she was just starting out, she found it very difficult to get accurate advice on basic quilting techniques. She found that the local quilt shops were less than helpful, and promised that if she had the opportunity, she would always be there to mentor beginners, to ensure that they would have an experience that helped stir their inner creativity and help them succeed. This, and her extensive background in retail has helped her create a thriving quilt business where you can always find helpful advice. Barbara joined the store in 2014. Barbara is the “Energizer Bunny” of creativity. As one of her associates once said, “ Barb is the only person I ever met that can make interesting art out of almost anything. She could probably do something really great with dryer lint if you asked her.” Barbara grew up in a family that owned a department store. She has retail in her blood. She studied Art History in college then lived most of her life near Santa Cruz , CA. She worked as an educator for those with special needs for 20 years. Over the years Barbara has expressed herself through a variety of crafts; including: textiles, quilting, printing, jewelry making, doll making, and painting. Most of her work over the last 20 years has been dedicated to quilt making and her little people. Quilting, however, was the first craft that she found that had a strong social element. In the late 1990’s she joined a quilting group in Scott’s Valley and every Friday night they would “Quilt ‘till You Wilt”. Barb left her role as an educator and began focusing on quilting after her move to Wilmington, NC. After moving to San Diego area, she found a home at Annie’s and found a business partner that provides a perfect complement to her creative energy. Her background in education prepared her to be a patient an effective instructor. Do you teach classes in the store? If yes, what types and on what kind of a schedule? Annie’s Quilting Den offers a variety of classes on monthly schedule. They range from beginning to more advanced. Beginning classes include All About Color and Quilting 101. More advanced classes include Feathered Stars, Not So Giant Dahlias, Double Wedding Ring, and Kaleidoscope Mania. All classes review the basics for safety and accuracy, with the goal that all students are successful. What is the “one thing” our shop does better than others? This is a tough question. We don’t spend a lot of time in other shops and we hear some good things about them. And so it is hard for us to compare.How about if we share some of the feedback that our customers have given us. Then we can discuss how these comments make us feel like we are doing the right thing. · On quilt runs, many people comment each year that we are energetic and engaging. We make an effort to engage everybody that walks in the door(yes it’s exhausting). · We recently had a customer say, “Your shop is not the largest, but I truly could buy any fabric in the store. I just love it all. · We have a least one or two customers a week say that our shop is unique to Southern California. We have fabrics that they have never seen and pallets of colors that are uniquely deep and rich. We think we make or break our relationship with our new customer in the first 30 seconds after they walk in the door. We want them to feel welcomed and see possibilities. We have built an entertaining and engaging environment that we are very proud of. We pride ourselves on our ability to encourage our customers to experiment with color, design and quilting techniques. We give classes in color theory and practice. We help people expand their skills to accomplish things they didn’t think possible. We believe that everyone can be a successful quilter, given the right tools, information and instruction. We want everyone to be as excited as we are! Most importantly, Annie’s is our dream. It has turned out wonderfully. We love going to work, the challenge and the opportunity. We like to show it and share it with anybody that walks in the door.